When Nandita announced this month’s ingredient for JFI, I decided to submit this childhood favourite of mine – Puli Milagai. 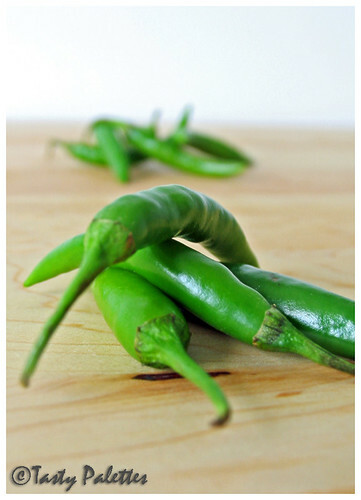 Spicy green chillies are simmered in tamarind with, surprisingly, very few spices. Don’t be alarmed by the amount of chilli in the recipe, after all, it is the star of the recipe. The recipe is put together with ingredients that takes care of the spiciness leaving you with mildly spicy and tangy sauce with a hint of sweetness from the jaggery. A word of caution if you are preparing a chilli dish for the first time. Open all the windows before you set out to prepare this dish. If your kitchen is well ventilated, you can sauté the chillies for 3 more minutes and then simmer in the tamarind sauce which reduces the overall cooking time. If not, as in my case, sauté no more than a minute, else it is very difficult to get rid of the spicy fumes trapped inside. This cooking time is compensated by simmering longer in the tamarind sauce. Also, don’t forget to use gloves while handling chillies. Now, don’t tell me I didn’t warn you. In a medium sized dry pan, roast fenugreek seeds till dark brown. Set aside. Heat oil in the same pan, and fry asafoetida evenly on all sides. Drain and grind with roasted fenugreek seeds and jaggery to a fine powder. In a small bowl, take a cup of water and mix the prepared powder along with tamarind paste, turmeric and salt and set aside. In the remaining oil, over medium heat, sauté the green chillies for a minute. Add the tamarind mixture to the chillies and cook for 20-30 minutes or until the chillies get cooked. Add more water if necessary. The chillies will turn from bright green to brown-green as they cook. Use powdered asafoetida instead of chunks. Roast the powder for few seconds and then add the chillies. Slit the chillies instead of cutting them into rings. If you are using raw tamarind instead of the paste, extract juice from a lemon sized ball of tamarind. This is a must try recipe for all those spice-lovers out there. It goes well with anything, from upma to curd rice, from idly to roti. My favourite combo is with dosa. My mom would make this in the afternoon when I am not home. By the time I am come back from school, the chilli fumes would have subsided and a hot plate of dosa and puli milaga would await me. In an attempt to recreate my childhood memory, I made dosa just to serve with puli milagai :). Puli milagai starring chillies goes to Nandita, who is hosting JFI – Chillies, an event started by Indira. Oh Yes! I can taste that already. Delicious!! wow yummy! i love the taste of puli with chillies can imagine the taste! nice entry! That IS a lot of chillies but it sounds super-good! The combination of ingredients is sure tempting and the dosas look wonderful too. Love the photo of chiles on the wooden board. I always take pics on my board, but they don't look near nice as yours! Isn't there another name for this? I knew it but can't recall right now. The golden dosa with the tamarind chilli is looking toooooooo good :)My mouth is watering. ISG, it is delicious. Try it! Laavanya, You will be surprised by the spice level of the final dish for the amount of chillies that goes into this. Sra, I have always known this as puli milagai. It can also be made with ginger, in which case, it is puli inji. Not sure what you are looking for. Looks great. Am sure the hubby will love it. this is the one i thought of posting it today:( u did it.what a coincidence.I love this so much and nice dosa.i am a big fan of both. Suganya, those chilles look lethal. Beautiful photographs. That Dosa is to die for. BTW you have been tagged for a meme. You make really beautiful pictures of your dishes and ingredients. This one looks like a dish i would definitelly enjoy (looooove hot food). And funny with the ventillation. Each time I cook, my boy friend is coughing his eyes out :) Now, I learned that opening the windows should be smart.... Thanx a lot. Hey...how do you do this? !!! Excellent photography. Ahhh!!! I am salivating!! Dosa and chilli looks so good together.Thank you. waw my mouth is watering dear. those dosas and the tamarind chilli looks toooooo good. Ah jeez... puli milagai... my mother had to forcibly stop me from eating it with everything, when I was younger! :) I LOVE this stuff! Your photos are soooooooo gorgeous, too. I wish someone would make puli milagai for me! Puli milagai sounds something like puli inji we make which is a sweet & sour sauce...i think this will be hot, sweet and sour :) Pictures are superb ! That just looks tooo tasty for words! Suganya, this looks dangerous! I'm all for it. Do the dosas have that slightly sour flavor (which I love), or is that only when fermented? I am just drooling over the chillies that you made. Wow, what an accompaniment to the meal. Lovely!! chilli looks great! and dosas are lovely!!!!!! Raaga, I have never had milaga thogayal. Can you pls post the recipe? GV, I am eager to see yr version. Anupama, Thank you for tagging me. I just finished doing that meme. Zlamushka, Ventilation is a must. The fumes linger for a long time. Mandira, That dosa is long gone now :(. I have given the recipe in a previous comment if you wanna make one. Shammi, My mom used to make this with lotsa jaggery before. I would eat it like halwa. This is an easy recipe, I am sure you wud make it. Shn, The recipe is the same. In this same recipe, you can add chunks of ginger for a 2-in-1 dish. Thank you, Usha and Nupur! Susan, Whats life w/o spice? This dosa is not fermented, hence it does not taste sour. Pintoo, Vanamala, Usha, Thank you very much! What a recipe for people like my husband who will die for spicy food. Recently, I pay more attention to your pictures than your recipe. Can't help it. Wow love your hot recipe! wow, looks beautiful suganya! Love spice and tamarind combos, and with Dosa, must be divine! I love spicy food! I remember when my mum used to cook spicy food, I used to sneeze a lot because of the chilli! Your photos look lovely! Suganya I prepare more or less the same way and we call it milagai kuzhambu. Instead of jaggery we add a lot of onions too. I have posted one in my blog too a couple of months before. 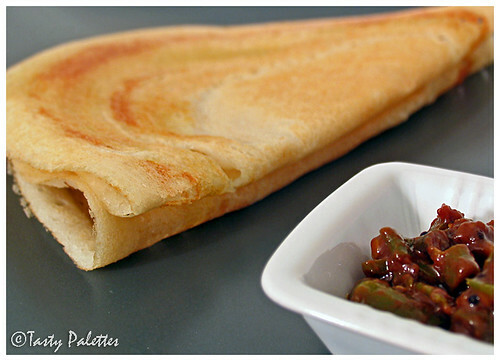 Crispy dosa with puli milagai would sure taste yummmm... But in opinion,it goes very well with curd rice. Thank you Suma, Dee and Nelam. Coffee, it was pleasantly spicy I should say. No Blog Patrolling this month? Yeah, We all need a break once in a while! Sobila, You can post yrs too. I love to learn variations the in yr recipe. Prema, I saw that recipe. Looks like another version of this. But adding onions brings in a whole new dimension, don't you agree? Looks absolutely delicious,with huge windows in Indian kitchens, ventilation is really not a problem here...i must comment on the dosais that look the perfect golden colour! what pan did you use for the dosais if I may ask! Thank you Nandita. I use anodized pans. The colour has got to do with the recipe than the pan (you can see dosa recipe in my previous comment). Its ordinary vendhiyam dosai. I think no fermenting and predominantly rice gives dosa that color. Hope that helps. 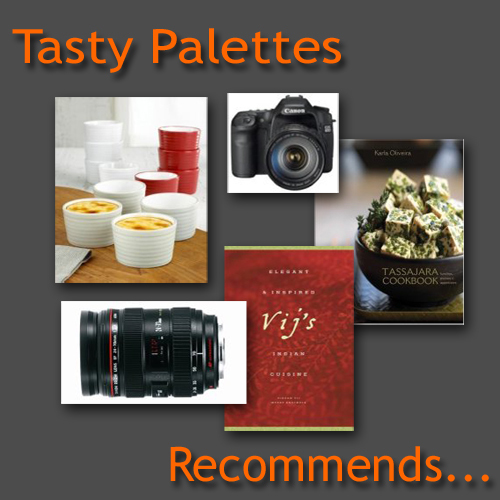 Suganya- What beautiful dosas to accompany this dish- you really know how to tempt your readers! Your photography is top-notch. Absolutely beautfiul and really clear. I saw your entry for July's DMBLGIT, I'll be suprised if it doesn't win something. I made your puli milagai recipe a couple of weeks back and it's still going strong. I didnt bother putting up a post on my blog because it would have been the exact copy of yours :) Man, it's yummy! 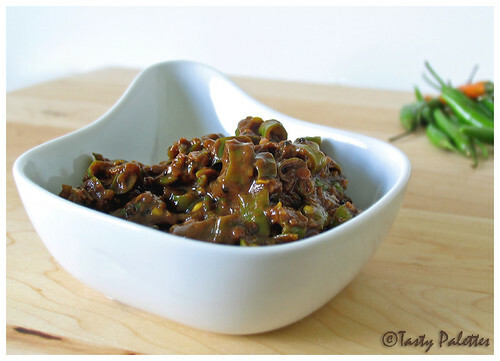 I've made a similar recipe before but as a thokku - basically, ground up the green chillies to a paste before cooking. Just as yummy, but I like the texture of chopped chillies better. GORGEOUS pickle! Glad the recipe was a success, Shyamala. I have tried thokku too, but it releases too much spice into the air in our 'small' apartment. I had a very horrible experience that our faces started burning and we had to leave the house till it subsided. That is something I will never try as long as I am in an apartment. Thank you for letting me know Shammi! I know, from your previous comment, you like to eat this like candy. I literally had it like candy with curd rice. I wanted to make pidi kozhakattai and puli molagai. This recipe sounds authentically close to the taste of my grandma's puli milagai.Thanks! this is also called as milagai pachadi. hi dear, how long we can keep ths dish...tht means shall we use it as pickle? for about 10 days?